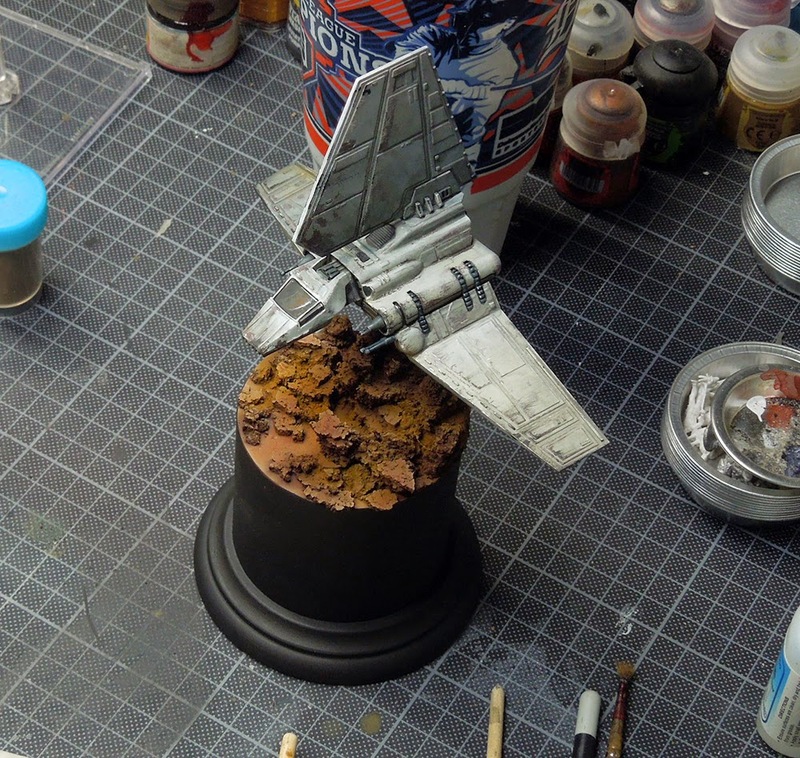 MASSIVE VOODOO: Tutorial: Repainting the X-Wing "Imperial Shuttle"
Tutorial: Repainting the X-Wing "Imperial Shuttle"
it is time once again to bring you the latest article you voted for via tutorial voting. Massive Voodoo's year of the painter keeps its promise and brings you miniature painting article joy weekly. 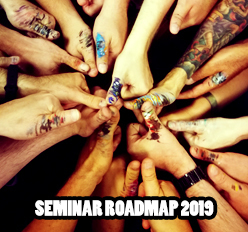 This Tuesday we jump straight inside Roman's brain and check back with an article he wrote for the german tabletop magazine "Tabletop Insider". The article in the magazine will be rather short compared to the big sum up here in english language. So we hope you enjoy and let us know if you do. Who is no Star Wars Fan? I mean really not? X-Wing the game is played on a lot of tables these days. So I've heard and I only can count on what I have heard as I am not into gaming myself. The miniatures you can buy for the game come prepainted and honestly I have to say they don't look bad, rather good for people who are really about the gaming aspect with them. Pretty cool. 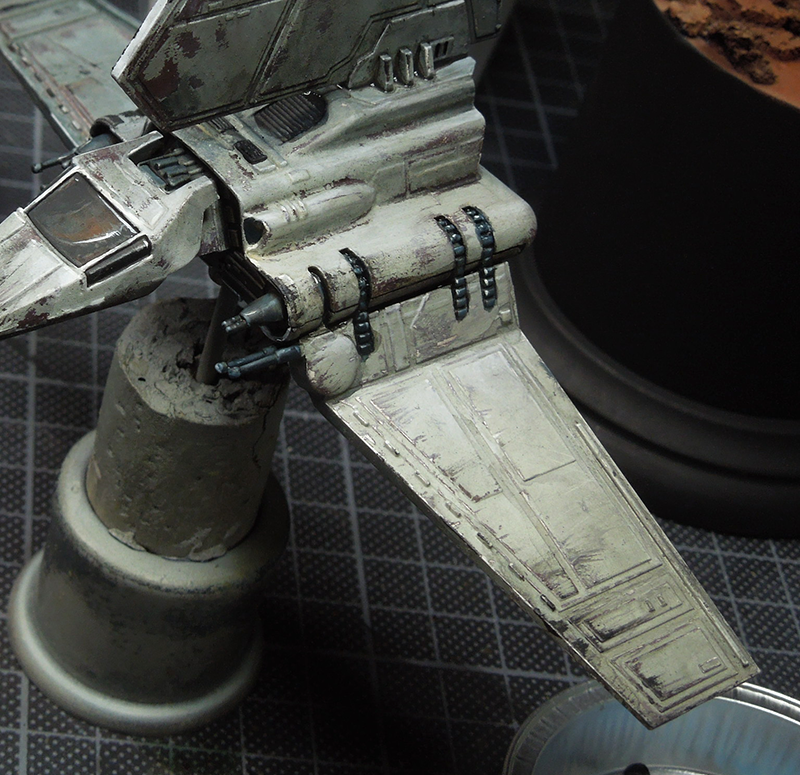 My aim was to paint it pretty damaged, but not totally. Just like it went straight through asteroids to set down on a rough planet surface. 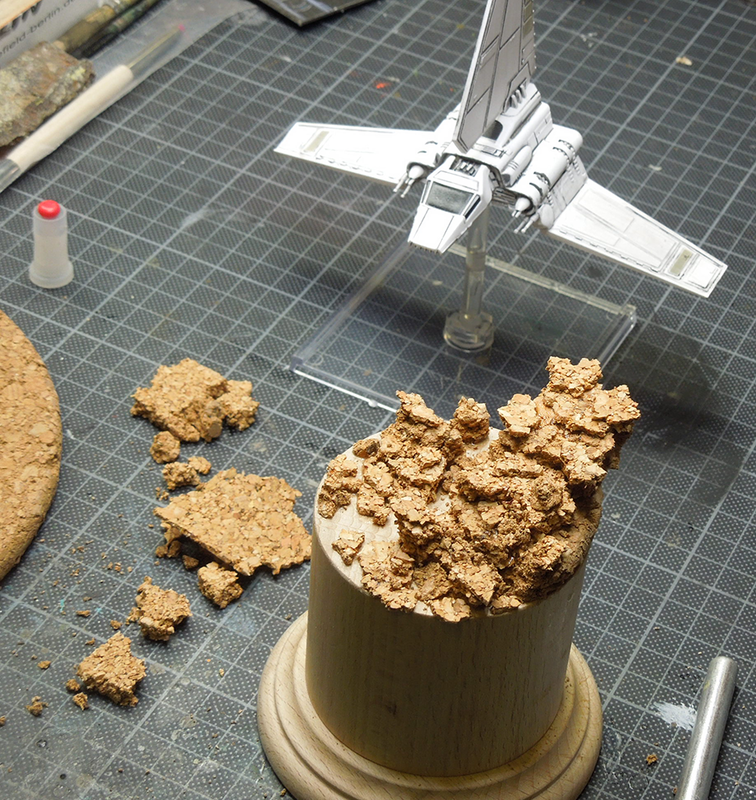 First step was building a little rough-planet-surface base from cork. 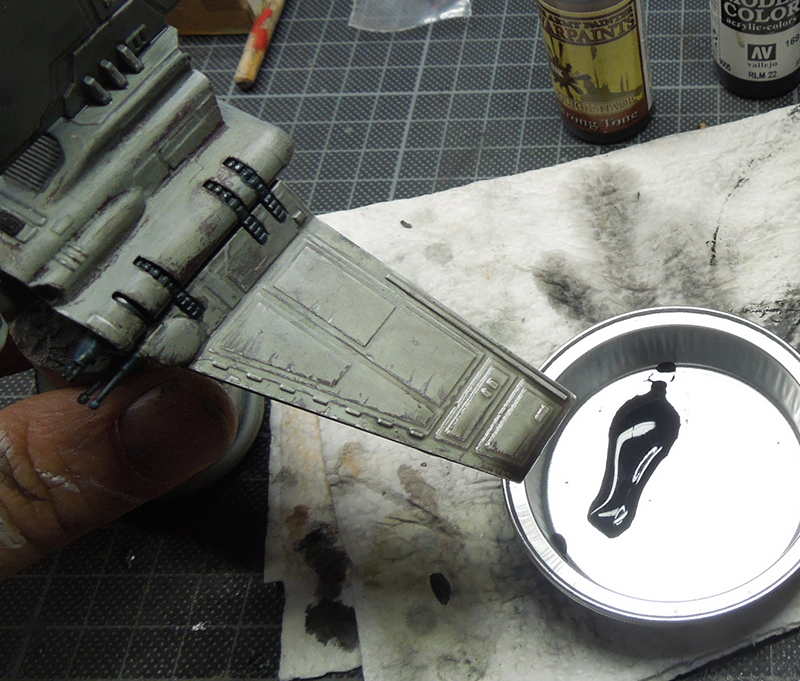 I took the repainted model and primed it black all over again. Now there is not turning back. ... place it in areas I want the greatest damage done later on. I used an old brush for it. Think about that damage, don't place it randomly. For example, the shuttle is flying straight forward, so the front parts and front edges might recieve the main damage when flying through tiny asteroids. 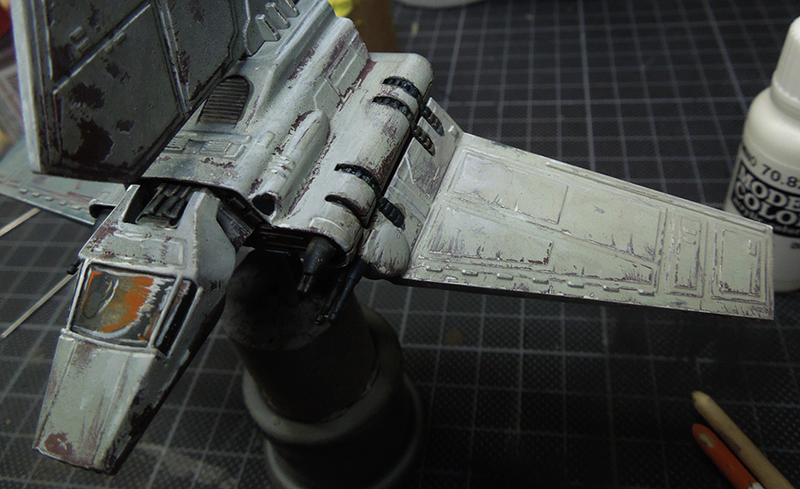 After this is dry I went back to the airbrush again and guess what: I did white again, how stupid, eh? 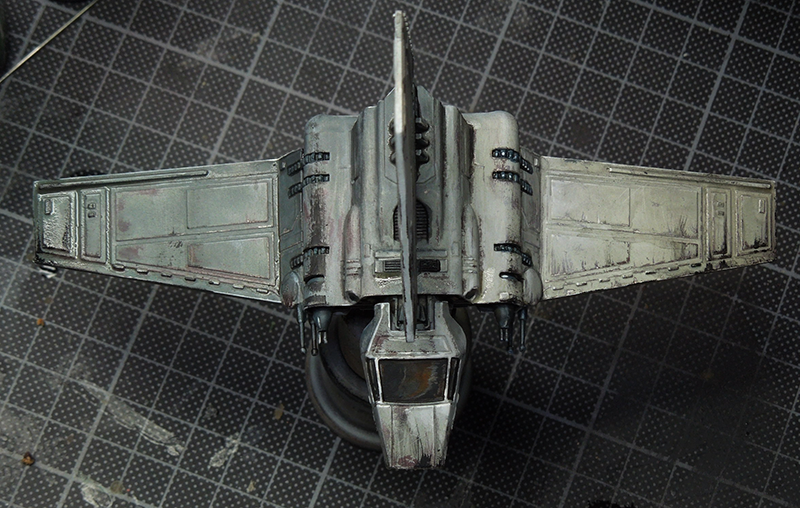 Well I did not strictly head for white via the airbrush, more a bright grey tone. I really sprayed it all but did minor changes in the colour hue. On its low side the tone was a little darker and I decided to do the same to the shuttle's right wing side. Why? 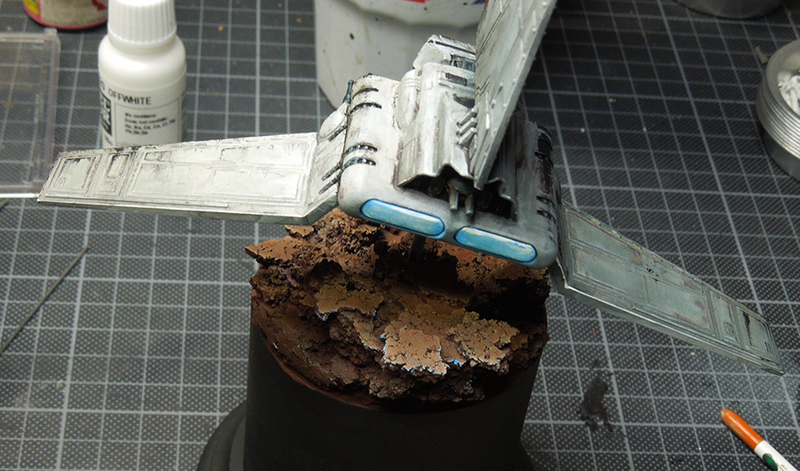 Well, I decided to place it in a interesting angle on that base so I am putting a light situation on top of it. And it makes the whole appearance more interesting. Hot water was placed in the areas I prepared with the Ak-Interactive Product. 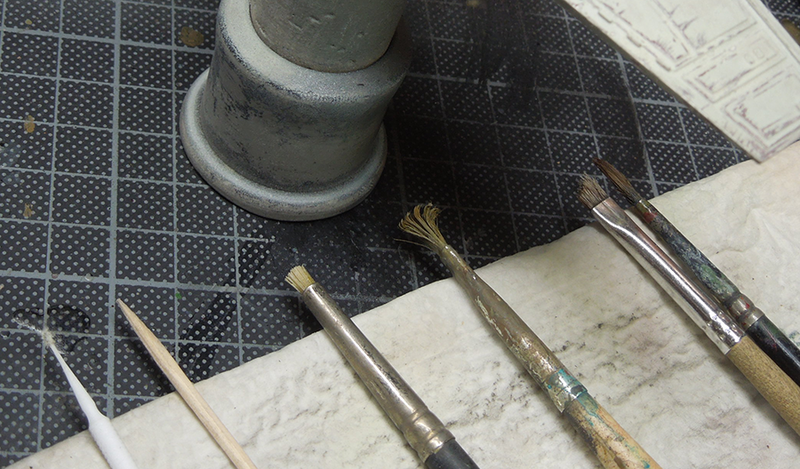 Then it is all about patience, using my tools to scratch of the colour. The warm water helps with that and the worn effects product let's it go easily. Yet again it is time to think about the damage not place it madly everywhere. 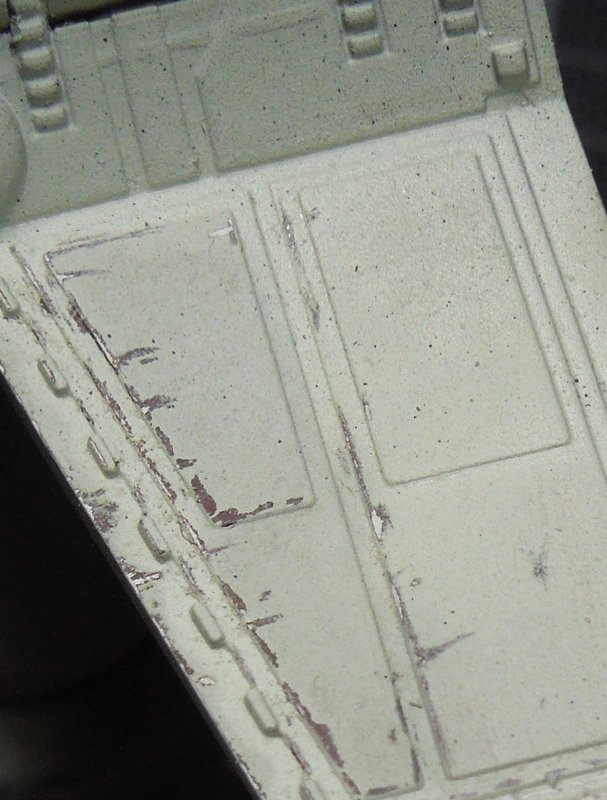 It'll take a while on some many edges and surfaces like on this shuttle, but it is rewarding. 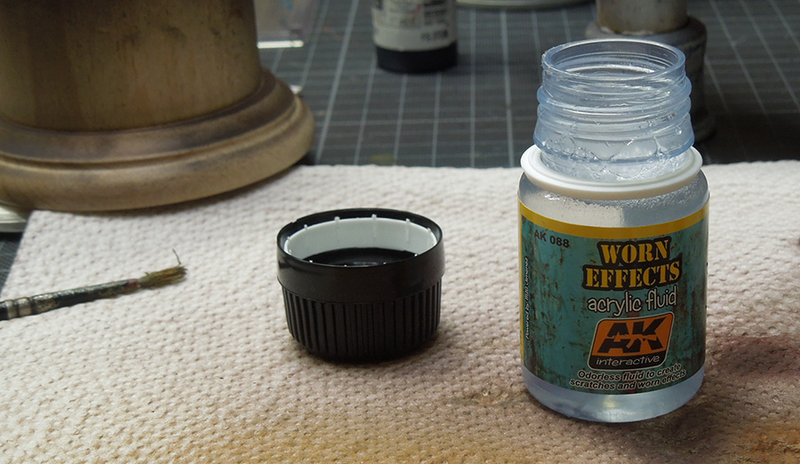 Instead of the ak product, you can also go with hairspray for the weathering and also use hot water. It does work, but it does not work in the same quality. The scratches and damages you get will not look as delicate. Using the airbrush again I sprayed a gentle touch of blue to the one darker side I have prepared earlier. 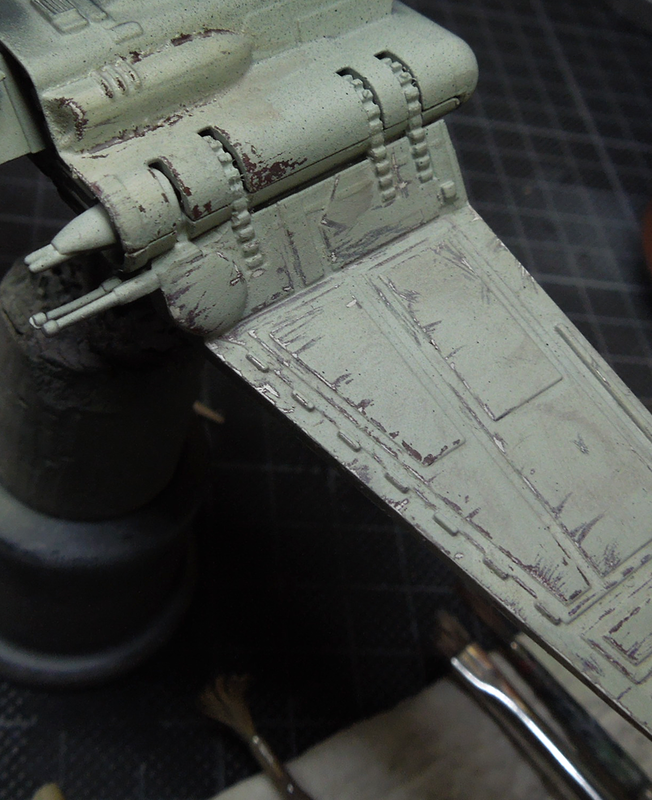 And drybrushed the base with some brighter sand colours on top of a brown basecoat from the airbrush. Now it was time to focus on the cockpit. Well, I went for a pretty strange way there. I knew the planets surface is an orange desert mainly so I wanted to see that reflected there, combined with some dark areas of the sky and space above. Some really strong white lines to finish the sketch of the reflection. 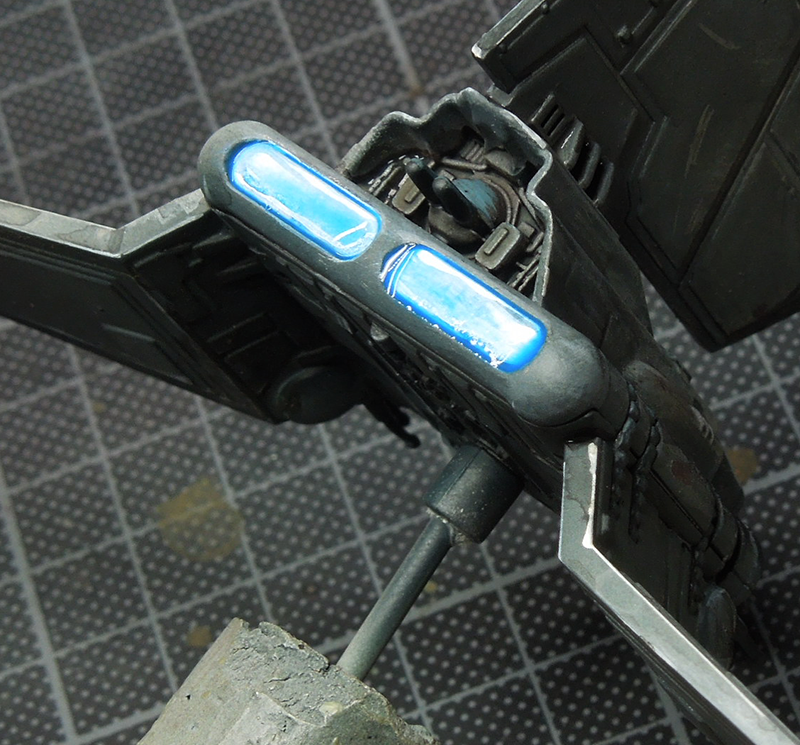 The weapon parts and all sorts of power unit stuff that was not planned to stay white was painted with a a blue/black. A black with a little touch of blue mixed in. 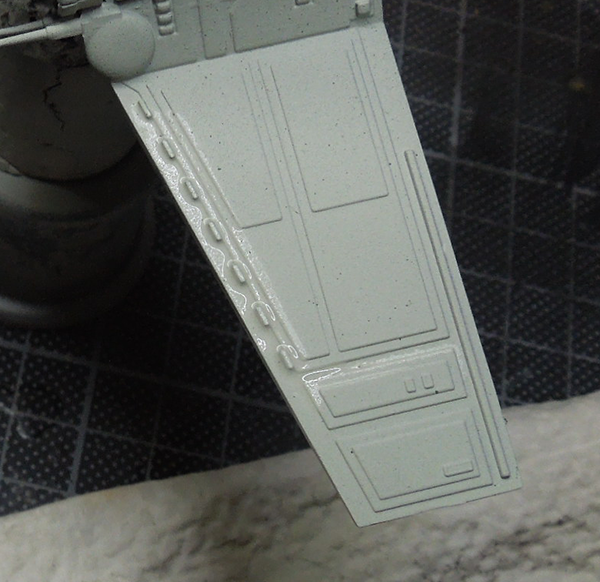 I started to use pure white to paint edge highlights here and there to the shuttle form and additional to some of the scratches to really mark them as deep ones. This also takes a little while and still the glass of the cockpit looks weirdo. Contrast. I was searching for it. 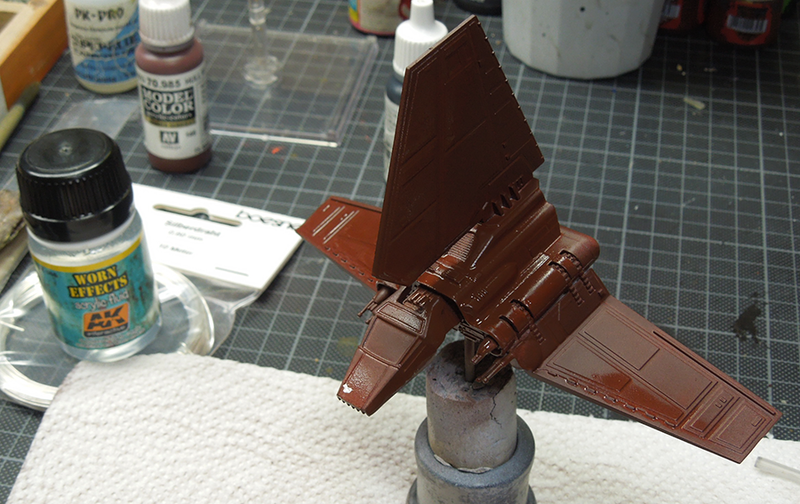 So I went for Army Painters Strong Tone, added a tiny touch of VMC black to it, thinned it even more with water and placed it on the outer areas of the wings. Several times after one applciation was dry. 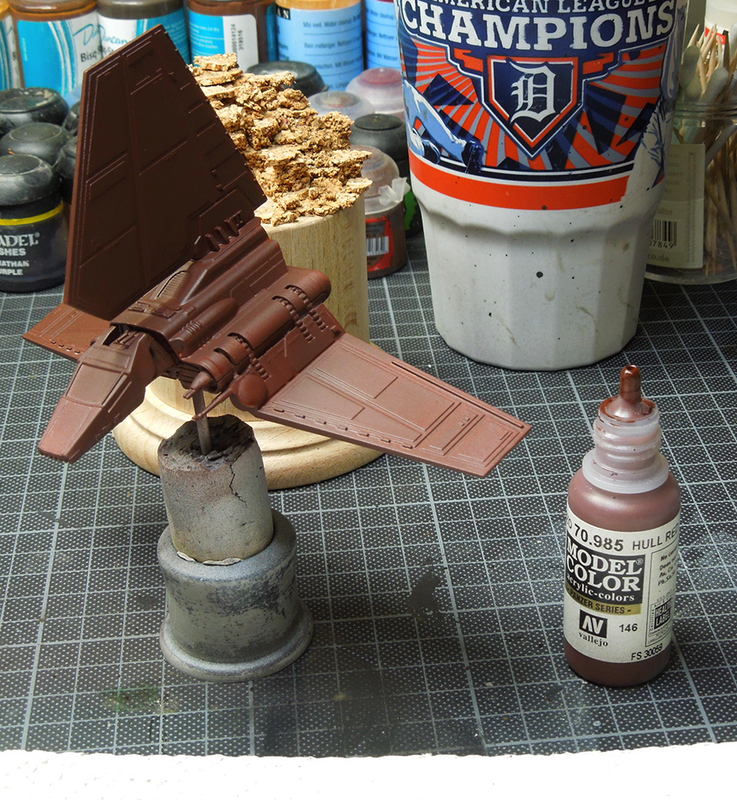 Did the same glaze over the weirdo cockpit. 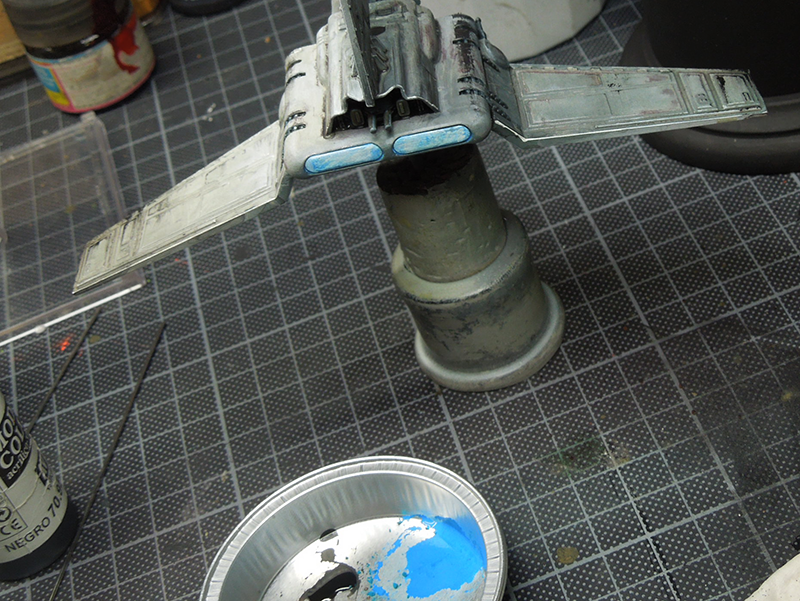 You can also see highlights on the black/blue parts by now, done by adding more and more white to this basic tone. 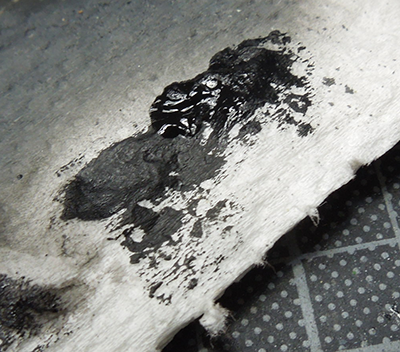 I wanted some really dark rough damage, looking like electricity or laser damage. 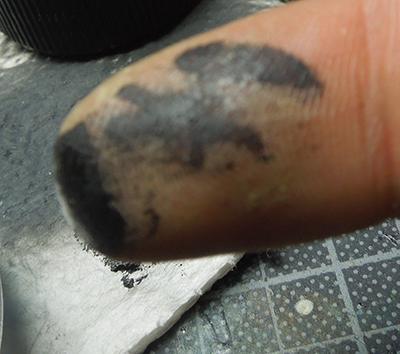 So I did put pure black colour on top of a tissue and used my finger to apply it. Tap! Tap! Pull! Tap! Pull! Fun! I repainted the reflection the cockpit with pure white. 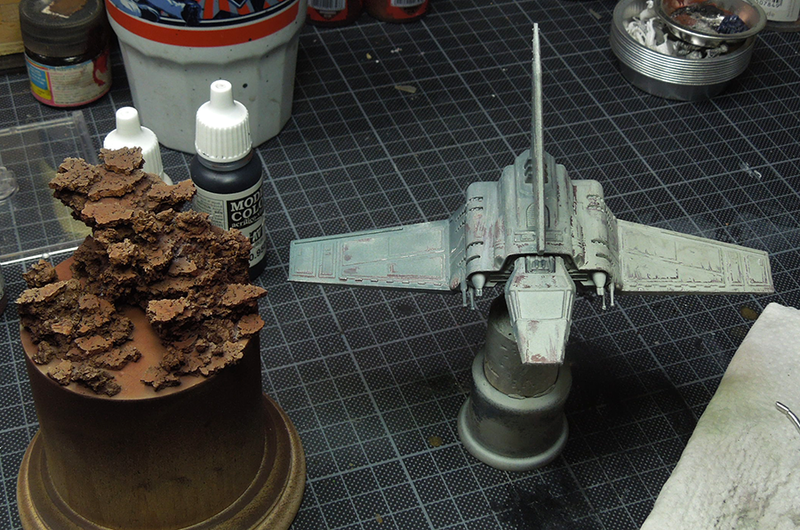 Looks like a pretty messed up shuttle, but well you never know what dangers lie ahead of one in a galaxy far, far away. To keep that ship still looking intact I went for a powerful machine in its back. Wrrrrooohhhoouuuummm! Drybrushing a little bit of a blue white mix to the base and you even have a tiny "Wrroohhoouumm-Glow-effect!". Well, I call it down at this point. It was really fun and I hope you like the result. It is no high end showcase model here, in fact to less time was spent in redifining edge highlights and the weathering, but I had my fair share of fun with it and it looks definatly different and more battle approved then the original prepainted version. 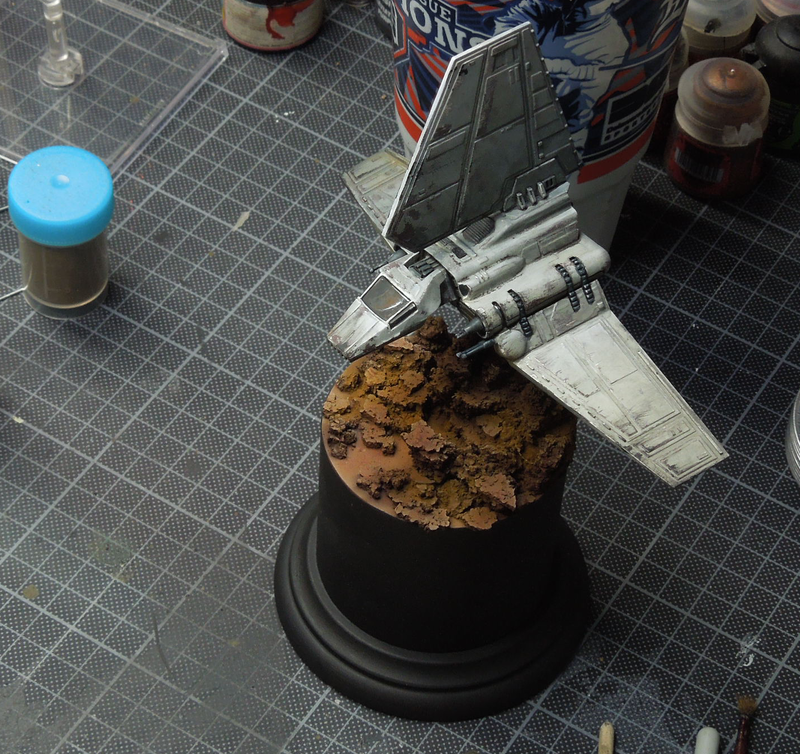 Dark brown pigments were used on the base for the final touch. One last thing: You might recognize a little yellowish/sandy touch to the outer wings. I did this with a used tea bag, but I did not want to tell you during the article as I felt some of you might call this disturbing. I placed the teabag and used its water/tea content as a glaze in some areas. Just let it dry. Keep on happy painting, jungle painters! 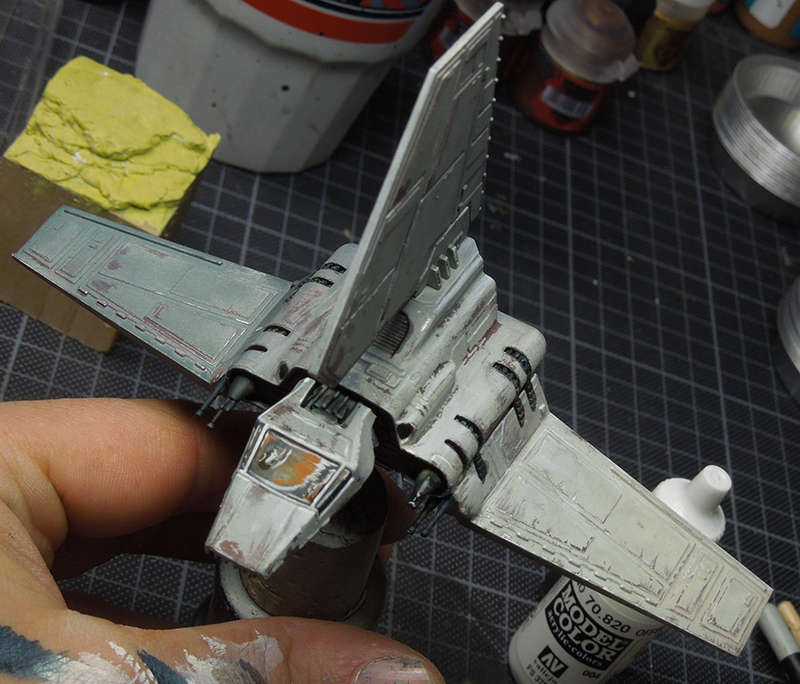 There are 10 Kommentare for Tutorial: Repainting the X-Wing "Imperial Shuttle"
Very cool article. 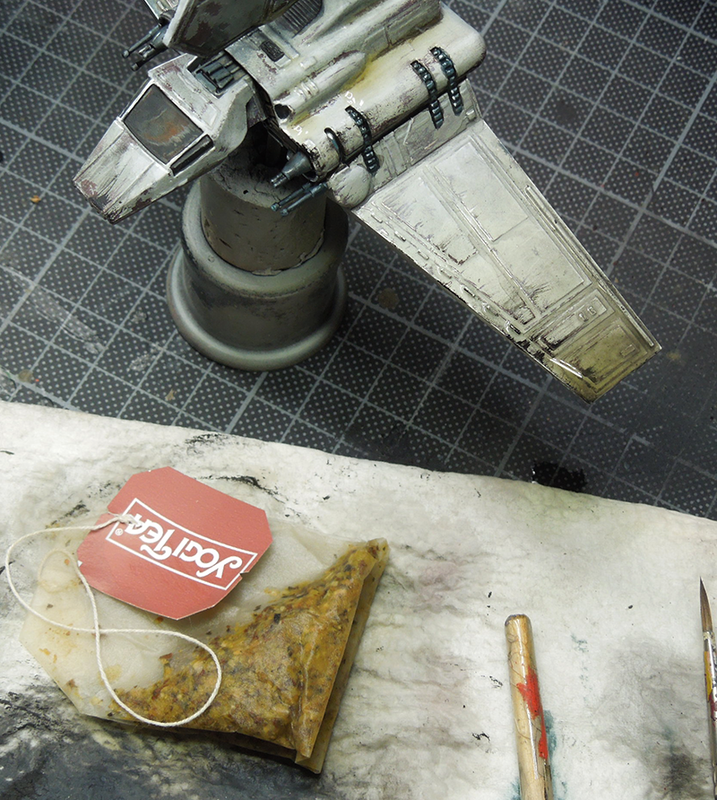 Star wars stuff looks fun to paint,keep up the good work,regards. Happy that you like the article!